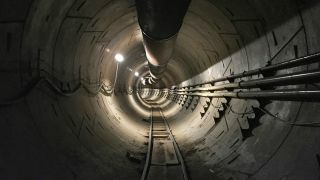 Not content with changing the way we drive our cars, power our homes and head to space, Elon Musk also wants to consign traffic jams to the history books with a network of underground tunnels in the world's biggest cities – and he's just shared a picture of one of those tunnels for the first time. Posted on Instagram, the tunnel is part of a test project being set up close to SpaceX headquarters in Hawthorne, Los Angeles, with the permission of the local authorities. The idea is to see whether Musk's new Boring company can really build tunnels at a lower cost and with greater efficiency than everyone else. If the grand vision of a tunnel network does become a reality, you'll be able to have your motor vehicle lowered into the underground network and propelled down a series of tracks to help you beat the worst of the rush-hour traffic. As notable as the picture is for being the first underground image shared by Musk, it doesn't reveal too much about his company's plans – you can see the lighting, wiring and wall panels in place, as well as some kind of track, though it's likely that a tunnel designed for public use would look significantly different to this. Musk seems confident that his tunnel network idea has potential, and could significantly cut travel times, though he has warned that getting the necessary regulatory approval could be tricky. Another test site was recently given the go-ahead in Maryland. Musk's social media feeds appear to be the best place to stay up to date with everything the Boring company is up to.